Debate: Has The Right To Bear Arms Outlived Its Usefulness? A group of experts faces off over whether Americans' Second Amendment rights are outdated. Debate: Has The Right To Bear Arms Outlived Its Usefulness? 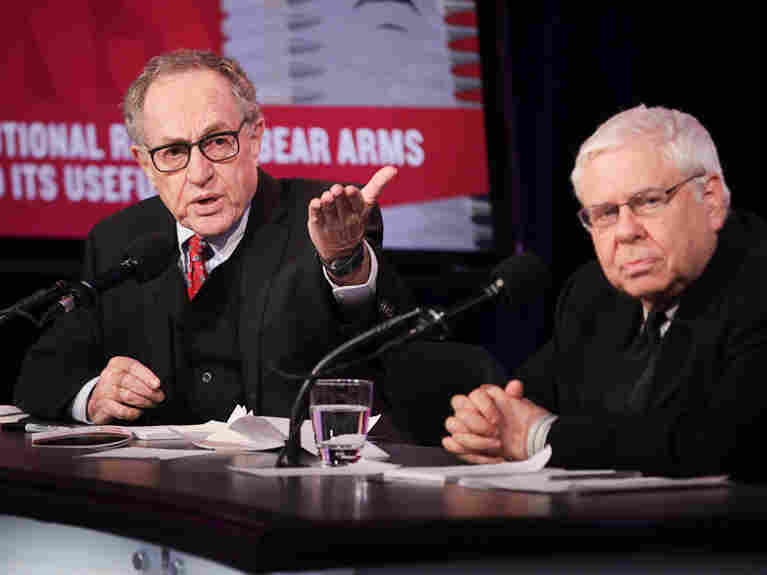 Alan Dershowitz and Sanford Levinson argue in favor of the motion "The Constitutional Right To Bear Arms Has Outlived Its Usefulness" in an Intelligence Squared U.S. debate on Nov. 14. If Americans were writing the Constitution over again in 2013, would it make sense to include the right to bear arms? Or has it become outdated? Some argue that states should have the ability to decide the laws they want around guns, instead of having a national standard. And they point to the Second Amendment's language about the need for well-regulated militias as evidence of its anachronism. Others counter that the right to bear arms has become fundamental to the notion of self-defense and safety today — that without guns, people would be unable to protect themselves from criminals. They say it's important for that right to continue to be enshrined in the Constitution so that it is ensured for all citizens, no matter which state they call home. A group of scholars recently faced off on the motion "The Constitutional Right To Bear Arms Has Outlived Its Usefulness" in an Oxford-style debate for Intelligence Squared U.S.
Before the debate, the audience at New York City's Kaufman Music Center voted 64 percent in favor of the motion and 18 percent against, with 18 percent undecided. Afterward, 74 percent agreed with the motion, while 22 percent disagreed — meaning the side arguing that the right to bear arms has outlived its usefulness were the winners of the debate. Alan M. Dershowitz is the Felix Frankfurter professor of law at Harvard Law School. He joined the Harvard Law faculty at age 25 after clerking for Judge David Bazelon and Justice Arthur Goldberg. He has published more than 1,000 articles in magazines, newspapers, journals and blogs such as The New York Times Magazine, The Washington Post, The Wall Street Journal and the Harvard Law Review. Dershowitz is the author of numerous best-selling books, and his autobiography, Taking the Stand: My Life in the Law, was recently published by Crown. Sanford Levinson, who holds the W. St. John Garwood and W. St. John Garwood Jr. Centennial Chair in Law, joined the University of Texas' law school in 1980. Previously a member of the Department of Politics at Princeton University, he is also a professor in the Department of Government at the University of Texas. The author of over 350 articles and book reviews in professional and popular journals — and a regular contributor to the blog Balkinization — Levinson is also the author of four books, most recently, Framed: America's 51 Constitutions and the Crisis of Governance (2012). He has edited or co-edited numerous books, including a constitutional law casebook, Processes of Constitutional Decisionmaking. He received the lifetime achievement award from the law and courts section of the American Political Science Association in 2010. 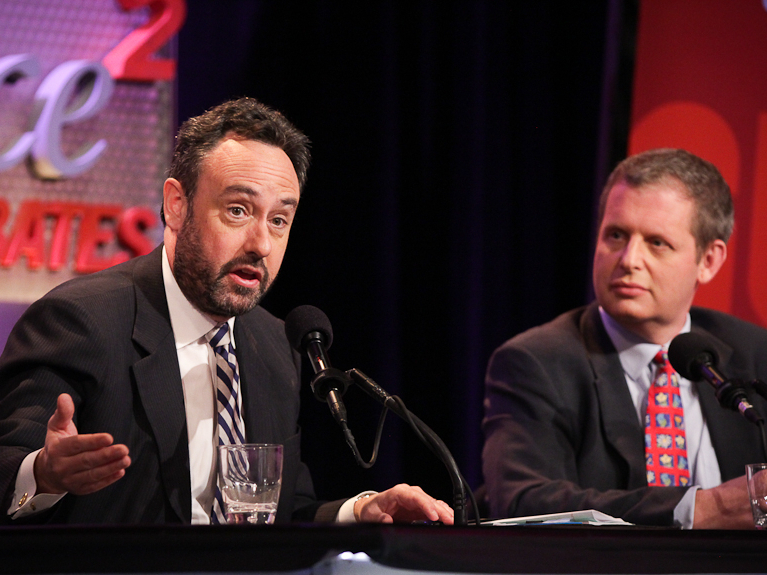 David Kopel and Eugene Volokh argue the right to bear arms hasn't outlived its usefulness in an Intelligence Squared U.S. debate. David B. Kopel is the research director of the Independence Institute in Denver and an associate policy analyst with the Cato Institute in Washington, D.C. He is also an adjunct professor of advanced constitutional law at the University of Denver's Sturm College of Law. In 1999, he served as an adjunct professor of law at New York University. He is the author of 16 books and 85 scholarly articles, on topics such as constitutional law, counterterrorism and police practices. His most recent book is Firearms Law and the Second Amendment (2012), a law school textbook. Kopel was a member of the Supreme Court oral argument team in District of Columbia v. Heller (2008). His Heller and McDonald amicus briefs for a coalition of law enforcement organizations were cited by Justices Samuel Alito, Stephen Breyer and John Paul Stevens. He is currently representing 55 Colorado sheriffs in a federal civil rights lawsuit against gun bills passed by the Legislature in March 2013. Eugene Volokh teaches First Amendment law and tort law at UCLA School of Law, where he has also taught copyright law, criminal law and a seminar on firearms regulation policy. Before coming to UCLA, he clerked for Supreme Court Justice Sandra Day O'Connor and for 9th Circuit Judge Alex Kozinski. Volokh is the author of two textbooks and more than 70 law review articles; four of his articles on the Second Amendment have been cited by Supreme Court opinions, as well as by more than two dozen opinions from other courts. Volokh is a member of The American Law Institute, a member of the American Heritage Dictionary Usage Panel, the founder and coauthor of the blog The Volokh Conspiracy, and an academic affiliate for the Mayer Brown law firm.